So, I'm past the thumbs on my Linden mittens, which is like the last lap, I think. There's a nice little stretch of mindless hand to knit before decreases. It was perfect for working and talking to my grandfather today. When I cast on for magic loop, I divide my stitches in such a way that the beginning of the round won't fall at the side break between needles. Otherwise, it would get all stretched out and sloppy. Things are going to get very knittery from this point forward, friend. I'm just warning you. 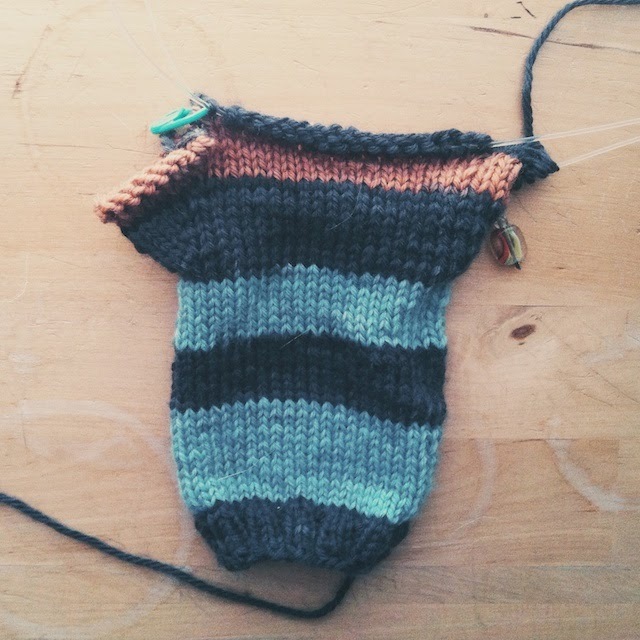 To do this I cast on each mitten separately on different circulars, dividing the stitches evenly for front and back. Then I join a mitten for knitting in the round, hang a marker on the first stitch (Since I know it will be at the side break, I just need to remember which side is the beginning), and work one or two rows in the round. I then repeat the process for the second mitten. When they are both at the same place in pattern, I'd slide one next to the other on a long circular, making sure they mirror each other exactly. I can always use different colored markers to clasp those stitches at the side together so they won't get pulled and look sloppy. You can see where I used a stitch marker to hold together those stitches at the side where I re-joined after working the thumb hole, just so they won't get too stretched out. Kingpin is a great color way! I'm so sad it's discontinued. This post is really making me consider two at a time. I'm done with my first mitten, we'll except the Kitchener and the thumb and need to cast on the second. I might actually finish in time! I'm thinking about casting on a second pair in a solid mustardy color and I might try this technique! Thanks for sharing! I love the idea of moving the side break away from where you've joined in the round. No matter what, this area always looks stretched and "wobbly" on my small pieces. You lost me when I read a bit further, but that nugget was enough. Thanks! That's a very smart way to do two at a time! 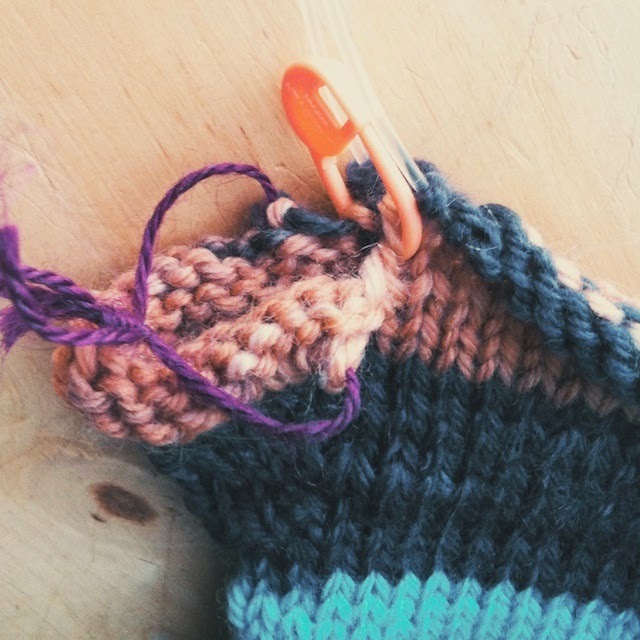 I love your use of stitch markers to move sock stitches around, too. I'm lazy and move things as little as possible, haha. You can always tell where I split my stitches on different needles. 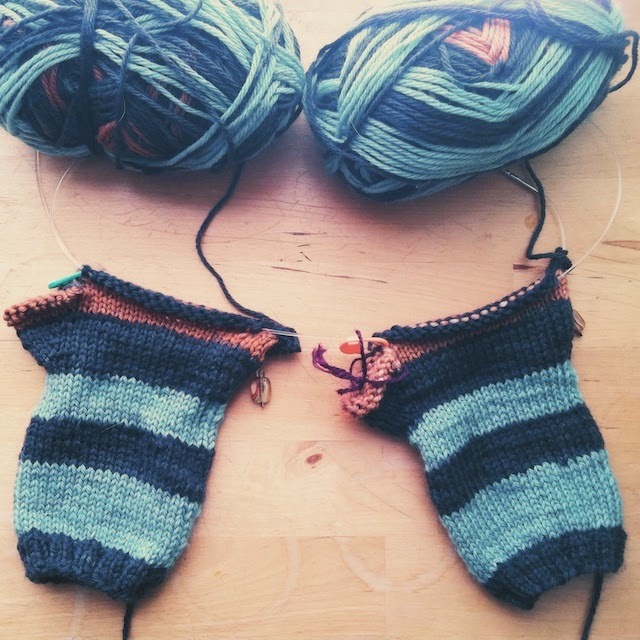 :) I'm hoping to at least start my second pair of mitts 2 at a time before the end of the KAL. Why discontinue Felici? They better have something good to offer instead because a lot of people seem to love it. I'd like to try that Caterpillar Green yarn that Jane is using for the KAL. Mustard will be fun for mittens. 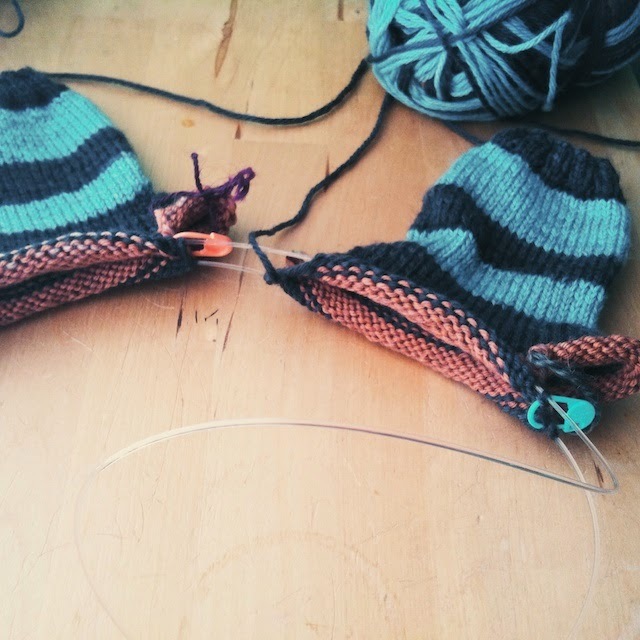 Vanessa, who commented above, did mustard for her first pair for the KAL and their fabulous. As far as advice, Kristen, I edited this post yesterday. My idea wasn't so good. Moving the thumb and beginning of round away from the side breaks would be okay except the top shaping works better with thumb and beg of round at the sides. So... forget everything I said except that stitch markers hold sts together well at the sides. Doh! I m lazy too. I realize that making your own mittens or socks is actually the antithesis of lazy, but as far as knitters go, I am lazy. I don't think things thru before plunging in. That's why I went back and changed this post. As I neared my mitten tops I thought, wait that wouldn't make sense... But doing two at a time is the way to go. I don't have a chance to get bored.